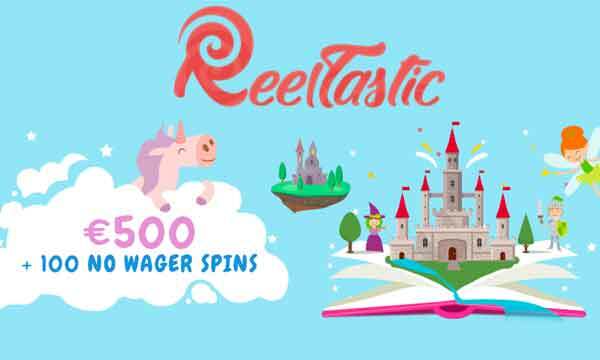 Claim A 100% Deposit Bonus & 50 Wish Spins On Starburst At Wishmaker Casino! Wishmaker is a brand new online casino and the Wishmaker Casino Bonus is very generous. All new players can claim a 100% match bonus to £50 and get 50 Wish Spins (all released in one go) on the famous ‘Starburst’ slot. Get your new casino experience of to a great start with the Wishmaker Casino Bonus. All new players can claim a 100% deposit match bonus on their first deposit. Plus you will also be awarded 50 ‘wish spins’ on the Starburst slot. 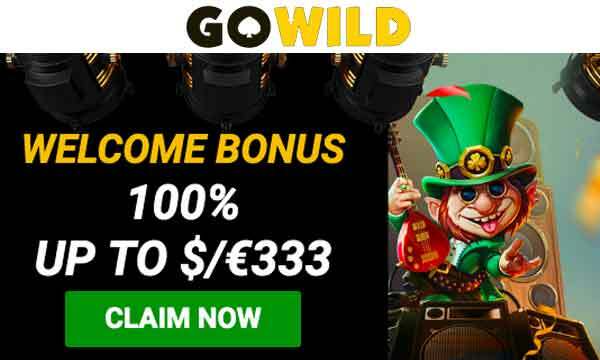 (Wish spins are what Wishmaker Casino call free spins). One thing to note about this bonus is that all the free spins are released straight after deposit. No waiting around to collect spins the following day! 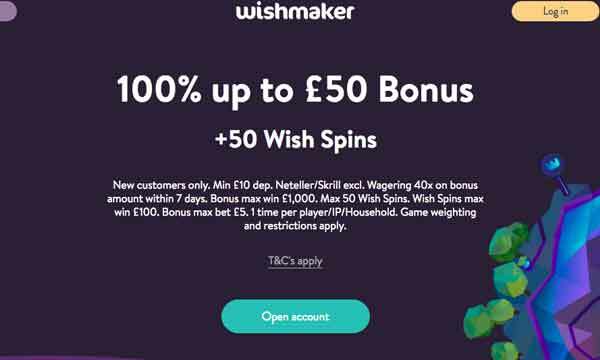 The minimum deposit to claim the Wishmaker Casino Bonus is £10. So for just £10, you will get £20 in playing funds plus 50 bonus spins on Starburst. We think thats great value! There is a wagering requirement attached to this bonus. Winnings from wish spins and the deposit bonus must be wagered 40x before they are added to your real money account. As you play at Wishmaker Casino, you will collect wish coins on your journey. Use these coins to buy wishes and get rewarded with plenty more wish spins, bonuses and other prizes! As you progress and reach new levels you will win wishing well tokens which allow you to play the unique and exclusive wishing well game. Every time you play, you are guaranteed a prize; the further you get, the bigger and better the prizes! 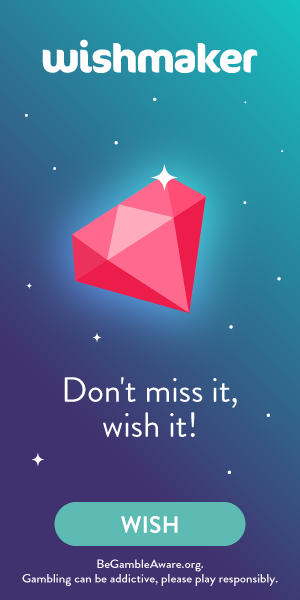 There are also lots of hidden Lucky Gems in the Wishmaker Casino world. When you come across one, make sure you collect it because when you collect 3 of a kind you will unlock a great reward. Wishmaker is a brand new online casino and we’re sure that it will be a huge success. the graphics are on point and the platform runs smoothly on mobile, desktop and tablet devices. Not only does this site look great, it is packed with the best games available. You can enjoy playing slots, jackpots, table games and live casino games. All of these games are developed and provided by the best and most respected software providers in the world. So quality is guaranteed. The Wishmaker Casino bonus is also going to be a real treat for new players. When you register and deposit just £10 you will be awarded a 100% bonus (max. 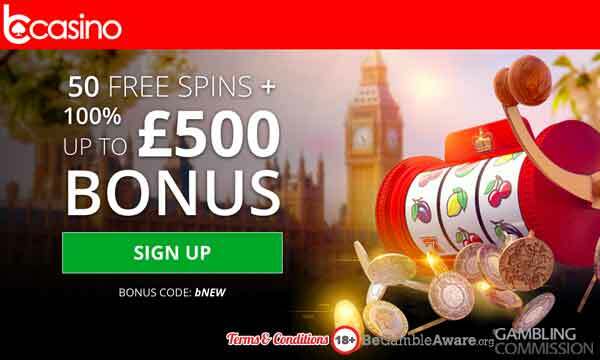 £50) and 50 bonus spins. All your wishes have come true! Plus there are plenty of rewards and bonuses available for returning players. Wishmaker accepts secure payments from Visa, Mastercard, Skrill, Neteller, Ecopayz, PaysafeCard, plus many more. Wishmaker Casino is regulated by the UKGC and the MGA. Wishmaker is a great addition to the online casino world – check them out today and get 100 spins on Book of Dead.